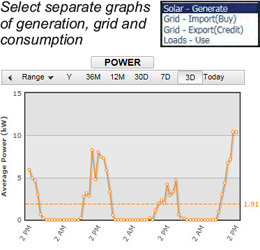 Separately view live power generation, grid import (buy), grid export (credit) and consumption. 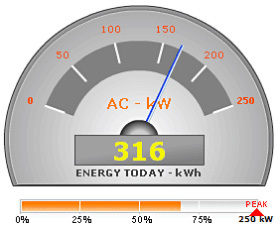 Use the AC Capacity gage to check how close to rated capacity the generation system is operating. 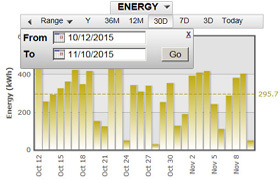 If solar power output appears to be low, use the ANALYZER tools to get more information for fixing the cause. By communicating over the internet through your computer or mobile device, you will always know how your system is performing. 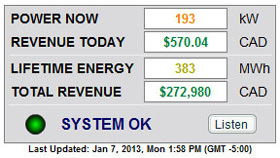 SolarVu continuously updates lifetime energy generated, used and grid import/export kWh. Savings from avoided power purchase due to green generation are also shown. NRGpilot saves data for the lifetime of the system. 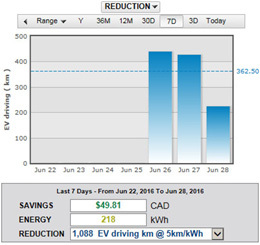 Use the graphs to analyze power, energy and savings for any time period. If the utility statement values do not match, download daily values if a review is required. Check the utility statement with matching billing period to verify that costs and credits are correct. Determine the contribution to climate change due to the carbon savings achieved from the solar energy generation.